The restaurant landscape in Erfurt has welcomed a new international addition with the opening of Bali Ubud, an Indonesian, specifically Balinese restaurant that has been open for almost a year now. I was worried that it wouldn’t appeal to the locals, since Indonesian food doesn’t conform to what Germans think of as “Asian” food. But it seems like Erfurters, or those who live in the city, are a more curious sort. The restaurant is well received, and is full of people around lunchtime. It’s prime location, full of foot traffic, certainly has a lot to do with it. Having eaten twice here, I could say that the dishes are authentic, while tweaking it just a little to suit European tastes. They use ingredients that Europeans are familiar with. So nothing weird like fish paste on the menu. The dishes are very filling, and they do vegetables well. 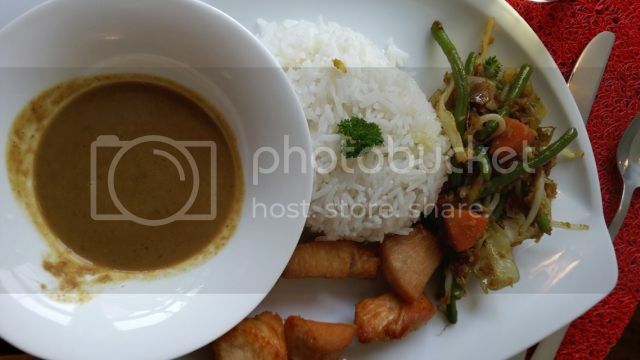 Their Chicken Satay was a bit dry, though, and their Kopi Luwak was…watered down? I really hope not. Maybe Kopi Luwak is really just mellow. I love the interior design of the place, they really did a good job of taking Balinese elements and evoking a tropical oasis in the middle of cold Europe. I really like getting invited to restaurants because it gives me the opportunity to try out new places and new cuisines. There used to be a stall at the Cathedral Square in Erfurt that sold Cretan products. They had olive oil, thyme honey, and cheeses from the island of Crete. It was run by a couple–he was Cretan, she German–who then decided to open a restaurant. It has been open for over a year now, and this is normally a make.or-break time period for a restaurant. If the novelty wears off and you still get a ton of customers, it means that you’ve made it! It looks like they did. I was part of a party of ten. We decided against ordering individual dishes and got several platters of Cretan specialties instead. So we had the meat platter, the appetizer platter (consisting of dips for the baskets of bread brought by the hosts), the cheese platter and the seafood platter, just to get a vibe of the restaurant. The atmosphere was great! Cozy place in the heart of the city–it’s better to pay more rent since the traffic that you get pays more than enough. I really liked the dips. And the fries were just luxurious–and not only because it was deep-fried in extra virgin olive oil! The meat was a bit on the dry side, but I liked the pork belly a lot. Over-all, it was excellent advertising for the owner’s home village in Crete. The interiors were cozy, filled with old family pictures, and a photo album was passed around, which showed the guests who made what. The Olive oil they sell, for example, comes from the olive grove of the owner’s cousin. The honey is organic and comes from a family friend. The cuisine wasn’t really my cup of tea, but I would visit it just to keep the variety in Erfurt’s restaurant landscape. And also for the freshly-squeezed orange juice. I sometimes get these unbelievably intense munchies for meat. Like caveman cravings. Like I could eat a whole plate of ribs in one sitting. And when I do there is one place I go to where I could reliably get a good plate of ribs: Faust Food (in English, Fist Food, a play on Fast Food. No it doesn’t translate well does it?). It is located in a 400-year old former warehouse, spartanly (manly?) decorations, kind of on the hipster side. It is not easy to find, but I swear it is worth it. The grill is located by the door, and grill everything in front of you. They do mostly American fare, but they also have steak, and Thuringian Bratwurst. They do uncomplicated, real food, manly food.Me likey. And with late opening times, it is perfect for pre-gaming meals before hitting the town. So for your protein munchie needs, I can heartily recommend this place. Sunday 11 am to 7 pm. Sometimes, I am not sure if something is delicious because it is delicious, or it is because of nostalgia. 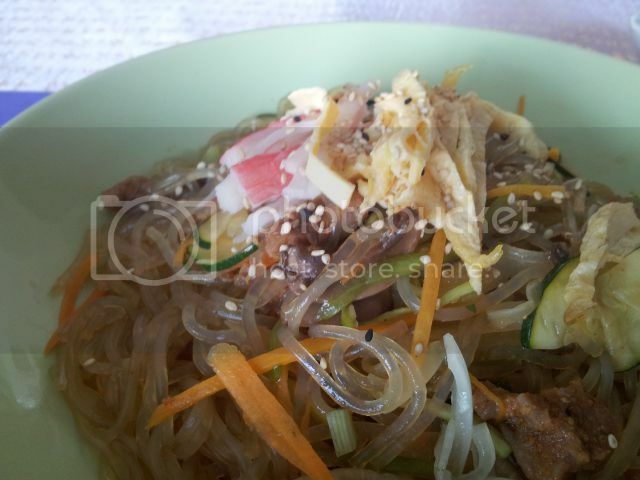 One of the things that I have sorely missed is a good Chapchae, Korean glass noodles made from mung bean. Last time I ate it, I made it myself. Or was it in Manila? Nevertheless, Korean food is finally making its way to the provinces of Germany, with San in Weimar, and now, Bab & Bab in Erfurt! It is run by 2 very nice German-speaking Korean ladies. It is very close to the hospital and the university, right in front of the tram stop “Klinikum”. I made a mental note to drop by as soon as I got the chance, and ordered a big bowl of Chapchae that I inhaled, slippery metal chopsticks be damned. They have € 5.50 lunch specials, and they don’t serve much outside of the hits of Korean cuisine (Bibimbap, Chapchae, Kimchi). The Kimchi, which they make themselves, is delicious. Just the right amount of tang and spice that added that welcome kick to the Chapchae. So to settle things, I will have to make another visit. I am encouraged by their assertion that they have a very busy lunch crowd, because I really want them to stay! Sorry for the long absence! Anyway, I’m back and happy to report that I have found THE best donut ever (for now)! It’s a discovery that I made in Frankfurt, thanks to a chance encounter. It was love at first bite. 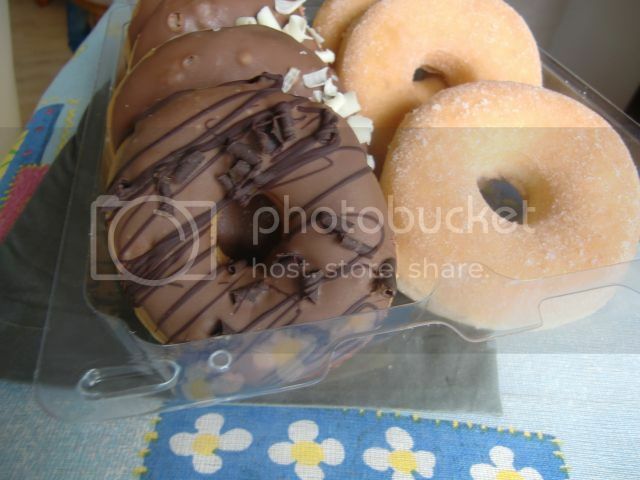 Chocolate covered donuts, chocolate filled donuts…don’t let the weird name put you off, Happy Donazz is so fluffy and soft, and surprisingly not super sweet. Seriously, I was so smitten that I even asked a friend to bring home a box of the stuff for me from a family trip, which is what you see in the picture. According to the website, the recipe came from Arif Haydin, who baked donuts for American soldiers in the bases in Southwest Germany. His son Izzet has continued the tradition and established the donut shops in Germany. And I am so glad he did! If I had the money I would open a franchise in Erfurt. Here is a list the branches in Germany. If you have one near you, go try one and tell me about it! For one of my favorite establishments in Erfurt, it is quite surprising that I have never taken a picture of the restaurant La Petite France. La Petite France in its old and new location has always been a small bistro where you could get French specialties like wine, olive oil, and cheese. It is an ideal place for a romantic evening for two, where quiet music, low lights, amazing cheese, and wine can get the mood going. Whenever I am in the area, go there and try great cheese that I would not know of otherwise without blowing the bank. Last week I decided to try out Mimolette, a hard, yellow cheese with cheese mites on the crust. The last time I was there, I tried a Sainte Maure, a lovely goat cheese covered in ash with a piece of hollow straw (as in hay) inserted in the middle. The owner said that this facilitates the aeration of the cheese. This is a place that I willingly patronize despite the distance from my home, because they really do have amazing cheese. I swallow a few lactose-intolerant tablets, try their goat cheese in honey and lavender flower, and for a few moments I am in France. Closed Mondays, Sundays and holidays. A side trip to Berlin for TQE’s belated 30th birthday party was one of the more satisfying and jam-packed 24- hour whirlwind trips I have ever taken in my lifetime. I decided to ignore my body and my subconscious’ signal to SLOW DOWN (if a dream about being almost sucked into a tornado is a sign for someone to slow down, I don’t know what is) just for this one weekend and headed over to Berlin, where Adam and I finally went satisfy my years-long Ethiopian food munchies at Betje Ethiopia, which a former colleague of his recommended. First of all, I would like to praise TQE’s unbelievable Panasonic Lumix camera (I think it is a GF 6? ), which took still life photos with amazing picture quality in low-light conditions. Really, if I have ever envied one of Adam’s toys, it was this one. So we had this great lentil soup as a starter, which tasted like munggo guisado without rice. 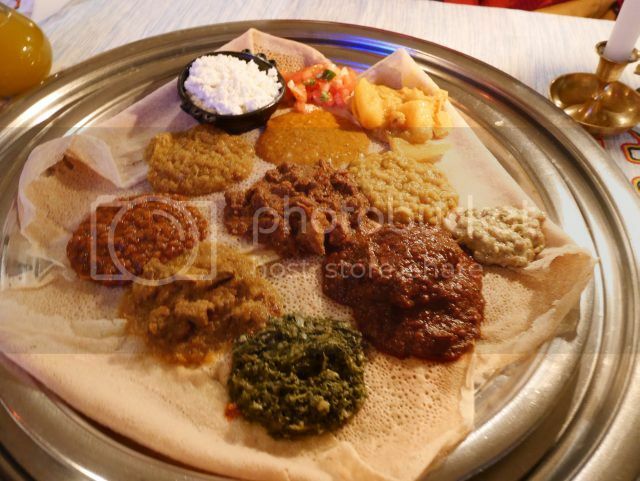 We ate it with injira, the traditional unleavened bread that Ethiopians eat with everything. And we downed it with tej, traditional honey wine. I got pleasantly buzzed but not drunk, and I know now after reading Cooked that fermented sweet things with an over 2% alcohol content does not occur in nature. But I digress. I came to regret even ordering appetizers. For 22 euros, we shared a huge platter about a foot and a half across that had this massive injira pancake on it, dotted with several vegetarian and non-vegetarian dips. We tore that injira bit by bit with our smelly, greasy Ethiopian-food stained hands hands until we said i no mas! with half a plate of dips still left over. Seriously though, I would have eaten the whole thing, especially since I especially didn’t eat lunch in anticipation. However, since we didn’t reserve a table, we had to leave by 7:30, and miss the traditional Ethiopian coffee roasting ceremony the restaurant has at 8. Seriously, guys, if you want to eat here, reserve a table, and come with an empty stomach. After hitting the Berlinale Film Festival for a movie and coming home to a fitful night’s sleep at around 1:30 am, I woke up to be fashionably late at Adam’s brunch party, which was held at a restaurant called 12 Apostel. You take the S-bahn to Savigny Platz, take the exit to Bleibtreu Strasse, and you’re right there. If there is any German city that takes brunch to another level, it is Berlin. 12 Apostel is a growing Italian chain restaurant in Berlin, and for 18 euros, you have the brunch experience, bar none. They have bread. They have scrambled eggs. They have fruit, deviled eggs, bacon, and did I mention the panna cotta? And the crepe station? And the juice and water station? They really had everything, and an amazing cheese selection to boot. A warm drink, a glass of Prosecco, and the juice and water bar is included with the meal. Really, I just wanted to have one little bit… more, but sorry, I was so full. I even took a walk in between courses just to pace myself. I swear by the panna cotta. How they are able to mass-produce such an awesome panna cotta is beyond me. 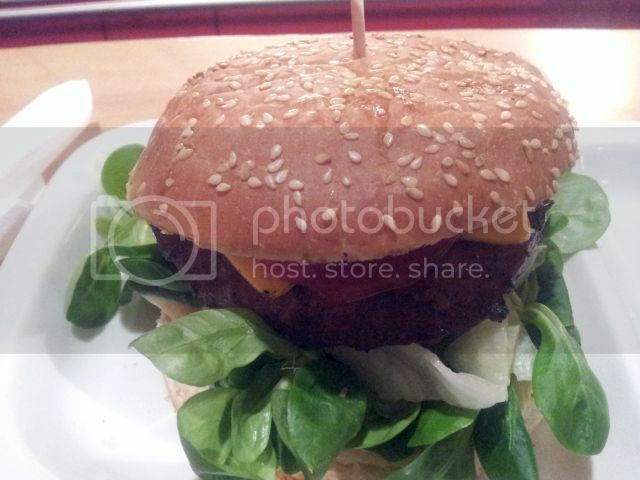 TQE credits Snooker in Berlin for the amazing restaurant find. It was the perfect party. Great company, good food, what more can you ask for? Thank you Adam, for hosting such a great weekend! I eat at several places to get my Japanese food fix in Erfurt, and one of the places is Gingko Sushi. It is owned and run by an elderly Japanese couple in what must be their 80s. The husband comes from Yokohama, and speaks excellent German, and his wife barely speaks the language, so my anime Japanese comes in quite handy. This is the place to go to to experience authentic Japanese food. 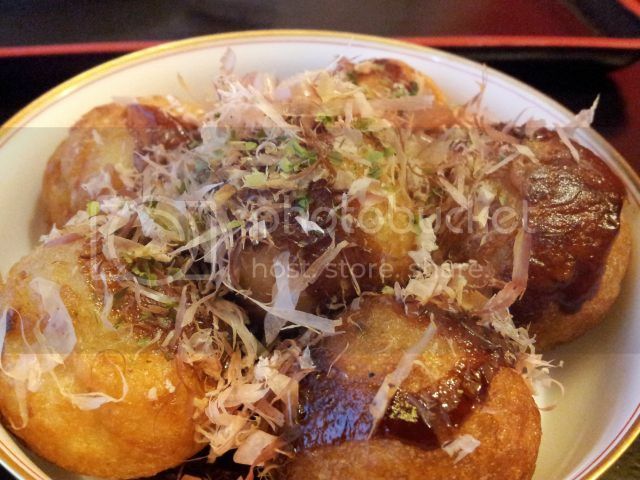 The food is excellent, and this is the only place I could get Takoyaki. The ambiance is also quite nice, and the location is very central. Now it should actually be more profitable, but why isn’t it? There are several reasons why it isn’t. The husband-and-wife team are getting on in age, and they sometimes don’t open when they should be. I have encountered closed doors when they should have been open several times. I think it is poor health, really. The food business is really for the young. This is also the reason for bad service. The poor woman can barely keep up. Japanese food is still quite exotic in these parts, and Germans in Erfurt still think all of Japanese food is just sushi. It makes me want to smack people in the head, but I think that is not happening here in Erfurt. And because of that, they are not willing to spend a lot of money on strange food. Admittedly, Gingko is expensive, with a meal for one person would set you back at least 30 euros. While I fear that Gingko sushi will disappear in a puff of smoke anytime soon, I try to eat there when I can. That is, when they are open. Open from Tuesday to Sunday, 2-8 pm. 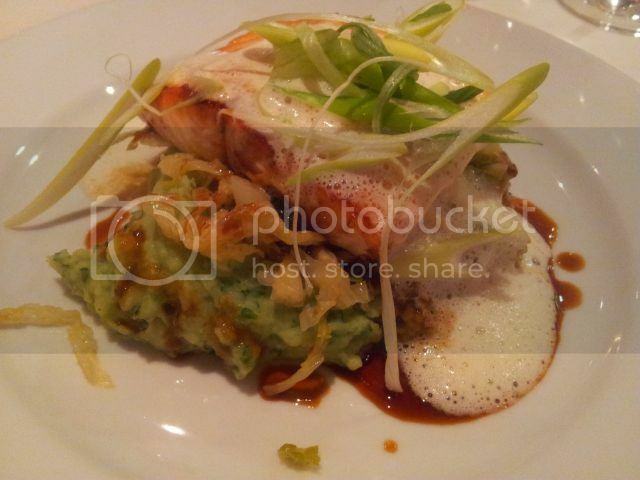 Salmon with leeks, juniper foam, on a bed of sauteed winter vegetables and parsley mashed potatoes. In the whole rush of Christmas activities, I have been quite remiss with my blogging activities. One of the parties that I attended took place in the Restaurant “Zum Alten Schwan,” which belongs to a hotel in Erfurt. 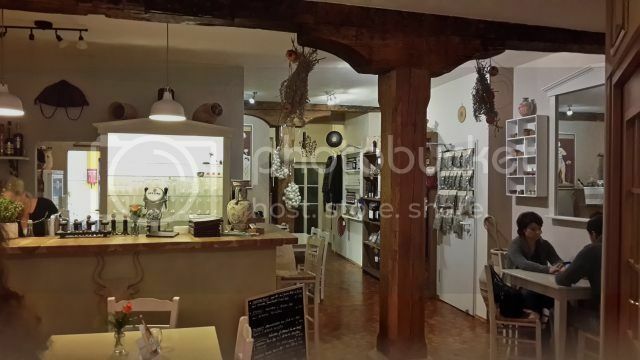 The building itself is quite old, as it was built in the 13th century, but the restaurant is relatively new. It is also located right in the city center, just behind the historic Krämerbrücke, which is an added plus. It sells itself as a fine dining establishment, but I would rather classify it as somewhere in between. The food is delicious, the restaurant serves traditional German food with a twist, and a three course meal set us back at least 30 euros per person. So value for money-wise, it is a good deal. They deal with the comfortable and familiar, so don’t expect cutting-edge cooking here. It was a very satisfying dining experience. The only thing that bothered me are the restrooms. They were so antiseptic-looking that I thought I was in a hospital, not at a hotel. Definitely time for a renovation! As with other European cities, Erfurt is being invaded by chi-chi restaurants that serve fancy schmancy-tricky food. Catalana is one of them. Catalana restaurant and its sister bar, El Goloso, has been an institution in Erfurt for almost ten years now, and serves excellent but expensive tapas. The one thing that I would comment about these restaurant types is that they would not be out of place in Barcelona. What I mean is, I could be in Berlin, or in Erfurt, and I wouldn’t bat an eyelash if you told me I was actually in Frankfurt. They all seem so interchangeable. I couldn’t put my finger on why was this dish so unique. What was so special about what I was eating? Case in point: There is a German joke attributed to Otto von Bismark that says if the apocalypse is upon us, you move to East Germany, since everything happens 20 years later here. Dude, I can only say YEP. Even the food trends. Molecular cooking is all the rage in Erfurt now. 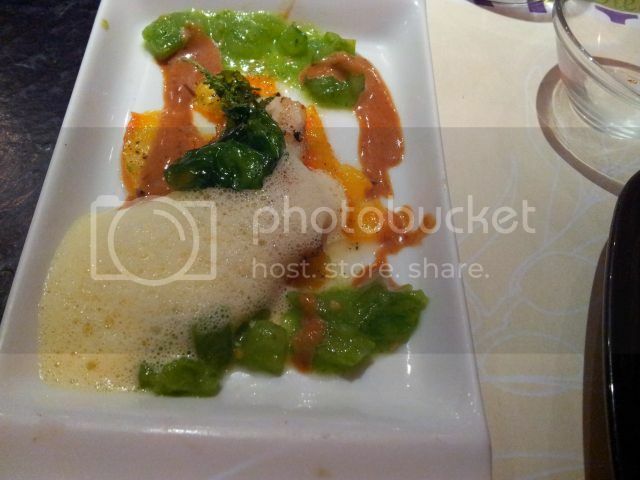 I understand it, I use principles of this in my cooking too, but restaurants like Catalana are really overdoing it with the lemon/lime foam sauce, the just-so-rare-beef, the crispy leaf veggies. Or maybe I’m just bitter for shelling out six euros for a plate of air and chewy beef? In a nutshell, food is good, but you eat at Catalana because the food is just so damned photogenic.